The flooding in various parts of the country is yet to abate and more people are counting their losses. The Executive Secretary, Benue State Emergency Management Agency (BSEMA), Mr Emmanuel Shior, yesterday revealed that the rampaging flood has submerged five communities in Agatu and other parts of Makurdi, the state capital. Shior spoke with reporters in Makurdi on the current flood situation in the state, adding that Rice Mill and other settlements on the banks of River Benue were also affected. He said the state government had taken proactive measures, including setting up a committee to sensitise the people of the state on the dangers ahead. He said the committee consists of officials drawn from SEMA, Ministry of Water Resources, Ministry of Information and other stakeholders in the state. Shior said SEMA, in conjunction with NEMA and other stakeholders, had embarked on an awareness campaign in the media, churches and Mosques. He said the campaign was intended to encourage residents of flood prone areas to relocate to safer areas. The BSEMA boss said the latest check with a guage showed that the water level at the River Benue had risen to 11 metres, barely one meter to its maximum level. He said centres in the state, including the International Market, had been prepared to accommodate displaced persons. Mr Lugard Slaku , the Zonal Coordinator of the National Emergency Management Agency (NEMA) for North Central, said that 12 states, including Benue, had been listed as most threatened by flood in the country. Slaku said while NEMA, SEMA and other stakeholders were working hard to ensure prompt response to distres calls, the people must cooperate with government to prevent avoidable disaster. 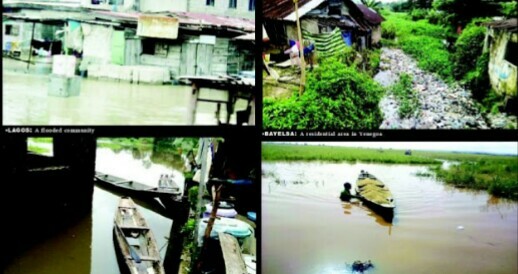 Residents along the Epie creek in Yenagoa yesterday bemoaned the impact of the flooding caused by the overflow of water from Taylor creek, tributaries of the Orashi and Niger rivers. Residents of the riverside settlements moaned that the water levels at the creek had risen above tolerable limits on Tuesday. Joy Elvis, a resident of the Onopa neighbourhood of Yeagoa, said that the residents were helpless in efforts to deal with the flooding, as the assistance, which the state government pledged in its sensitisation messages, were not in sight. “It has not been easy, the water levels have been on the increase and this is usually expected at this time of the year but on Tuesday, floodwater entered our houses and we have since been under intense pressure. “We need assistance urgently but no one seems to care; we have resorted to moving some of our valuable things to neighbours’ houses because the government did not provide alternative shelter for us. “Our prayer is that the water goes back soon because if it goes beyond this level, even the houses of the good Samaritans who are currently accommodating us will be threatened as well,” Elvis said. Another resident, John Abide, told NAN that the people had been compelled to use canoes to access their homes, following the increasing water levels in the past few days. “A lot of the affected people are not willing to leave their homes because they don’t want to be a burden to others; so what most people do is to adapt by constructing wooden platforms within their houses to keep important belongings safe from water. “Those who have canoes have to put them into use whenever they want to go out; we are people who go to the river regularly to fish, so we are not so afraid of water,” he said. Meanwhile, the Bayelsa government has pledged to ensure that no life was lost in the floods currently ravaging the state. Commissioner for Information Daniel Iworiso-Markson, who gave the promise in Yenagoa on Monday while commenting on the flood situation, said with the proactive steps which the government had put in place, there was no cause for alarm. He said the government was working round the clock to ensure that those whose houses were submerged by the flood got immediate succour. Iworiso-Markson urged the people not to panic, saying that the government was fully aware of their plight and would strive to forestall a recurrence of the 2012 flood disaster. He said the latest reports indicated that Egwe-ama in Brass Local Government Area (LGA), Imiringi, Ayama, Otuobhi in Ogbia LGA, Edwarie in Southern Ijaw LGA and Trofani in Sagbama LGA, among other communities, were affected by the flood. He urged residents who lived in flood-prone neighbourhoods to work with the State Emergency Management Agency (SEMA) and other relevant government agencies to facilitate their immediate evacuation from the areas in the event of flood incidents. Anambra State government is set to collaborate with the Nigerian Army Emergency Response Team to tackle flood challenges in riverine communities across the state. Governor Willie Obiano made this known after a meeting held with the army team in Amawbia, Awka South Local Government Area of the state. Obiano said the flood menace had taken a dimension that required more technical assistance, hence the request for assistance from Nigeria army as the lives of millions of the people were at risk. He commended the army for responding promptly to his appeal and pledged to facilitate the deployment of helicopters and other equipment to help the army team map out the already affected communities for the necessary interventions. Speaking at the meeting Dr Nkem Okeke, the Deputy Governor, said there was the need for the army to strengthen security in the Holding Centres set up for Internally Displaced Persons (IDPs). Okeke, whose office is in charge of the emergency agency, assured the team of the government’s assistance to ensure that no life is lost during and after the flood havoc. Meanwhile, Chief Paul Odenigbo, the Executive Secretary of State Emergency Management Agency (SEMA), said that the response would commence with communities in Anambra North Senatorial District because of their peculiar flood problem before spreading to other districts. Odenigbo noted that the state had eight flood-prone local government areas. He said the agency was ready to give the team every assistance to achieve quality result in the evacuation and maintenance of the displaced persons. The meeting was based on the visit of Maj.-Gen. Emmanuel Kabuk, the General Officer Commanding 82 Division of the Nigerian Army, Enugu, to Anambra. A series of meetings was held during which the military perfected plans on how to assist the state contain the flood. The leader of the team and Commander, Regiment Brigade of 82 division, Brig.-Gen. Mike Mamman, assured the government of quality assistance . He said that mapping of the flood-prone communities would entail embarking on appropriate rescue operations and deployment of the right equipment during emergencies. The affected local governments are Idemili South, Ihiala, Onitsha North, Onitsha South, Awka North, Ogbaru, Anambra East and Anambra West. Alhaji Yusuf Oseni, a Senatorial aspirant on the platform of the All Progressives Congress (APC) in Kogi, has commended the Federal Government for its political will to find lasting solution to flood in the country. Oseni, who is gunning for the Kogi central senatorial district seat, gave the commendation in a telephone interview with NAN in Lokoja yesterday. The National Emergency Management Agency (NEMA) has declared national disaster in Niger, Kogi, Anambra and Delta States due to flood disaster thatn affected them. President Muhammadu Buhari has approved N3 billion for the first stage of preparedness, response and disaster mitigation against the flood across the country. Taraba, Adamawa, Kebbi, Edo, Rivers, Benue, Bayelsa and Kwara states are also under close monitoring among other measures.